Taipei, Taiwan – April 10th, 2018 – CipherLab, a leading innovator in Automated Identification and Data Capture (AIDC), would like to present the 2200 series, built specifically for the retailing, hospitality and transportation industries. The 2200 series’ omnidirectional scanning capabilities offers environments such as convenience stores, supermarkets, department stores and even airline check-in counters a hands-free operation which allows scanning to be continuous and efficient. 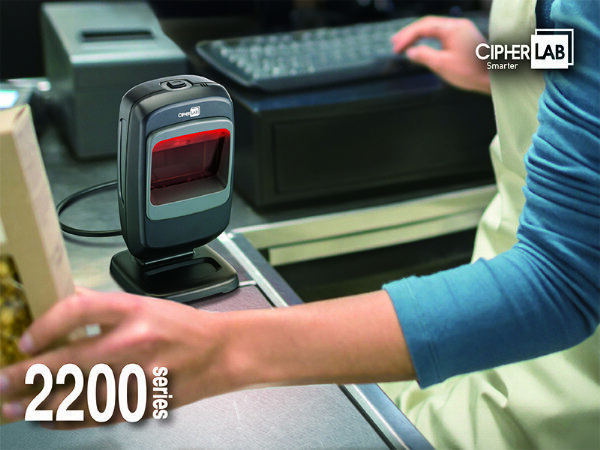 Additionally, the 2200 series’ snappy high-speed scan rate assures your business with reliable 1D, PDF417 and 2D barcode scans straightaway. Your business will instantly be able to read any barcodes quickly and efficiently. Moreover, it is capable of reading low contrast barcodes which eliminates the problem of scanning poorly printed barcodes, reflective surface label and LCD screens. Ultimately, your scanning needs will be free-flowing without any issues. “This is our first entry level presentation scanner with RFID capabilities." Steven Liau, chairman of CipherLab said, "Its fast and reliable scanning is also easily configurable to your needs." For more details and specifications regarding CipherLab 2200 series or other CipherLab products, please visit www.cipherlab.com.